Former Taoiseach (Irish PM) Bertie Ahern was among family and friends of the late Ian Paisley who gathered to remember him on what would have been his 93rd birthday. Catholic priest Fr Brian D’Arcy was also at the event on Saturday – the unveiling of a sculpture dedicated to the former DUP leader and first minister of Northern Ireland. 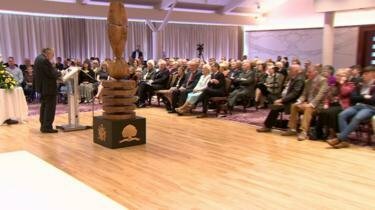 The sculpture was made out of a tree from the garden of the Paisley family home in east Belfast. Lord Paisley’s widow, Baroness Paisley, explained the story of the sculpture. She said: “We had a beautiful wych elm tree. It succumbed to age and we had to take the sad and upsetting decision to have it felled. A woodturner from Spiddal in County Galway, Liam O’Neill, was commissioned by the Paisley family. The family already owned a piece of his work, a bowl turned from a walnut tree which had stood on the site of the 1690 Battle of the Boyne, near Drogheda. It was given to Lord and Lady Paisley in 2006 by Mr Ahern to mark their 50th wedding anniversary. At the time, Mr Ahern was taoiseach and the gift was presented at the conclusion of the St Andrew’s negotiations in Scotland which paved the way for the DUP and Sinn Féin to enter into government together the following year. Known as the ‘Bertie Bowl’, the gift helped break down the long-held suspicion of the Paisleys towards the Irish government. Among the other politicians at the event were DUP North Antrim assembly member Mervyn Storey and former Lord Mayor of Belfast, Ulster Unionist Jim Rodgers. The detailed carving work on the sculpture was done by Phillip Steele, who is based at the Ulster Folk and Transport Museum near Holywood in County Down. 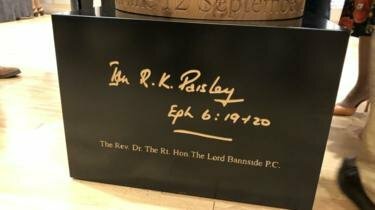 Lord Paisley died at the age of 88 in September 2014 after a long career in the House of Commons, House of Lords, European Parliament and Northern Ireland Assembly. On the base of the sculpture there is a flax flower representing the assembly, a portcullis representing Westminster and five stars representing the five terms he served in the European Parliament. The sculpture will soon go on display in east Belfast. The former NI secretary has said it was “foolishness” to believe the DUP would sacrifice their principles for money. Theresa May was wrong to think she could buy-off the DUP, according to former Northern Ireland secretary Shaun Woodward. Despite receiving £1bn for Northern Ireland in return for a supply and confidence agreement with the government, the DUP voted against the Prime Minister’s deal today. Speaking to talkRADIO’s John Nicolson, former minister Shaun Woodward said the DUP had acted exactly as expected. Mr Woodward said: “The DUP have been exactly as you would have expected them to be and they’ve been very faithful to their community in Northern Ireland that they represent. “I think it was the Prime Minister’s foolishness in imagining that she could slip them a big enough bung for them to sacrifice their principles. Mr Woodward said he believed the DUP’s actions were a consequence of Northern Ireland being “utterly betrayed” during the referendum campaign by “short-sighted” Brexiteers. 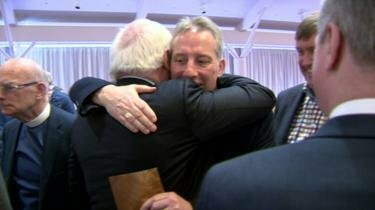 “The people of Northern Ireland were utterly betrayed into believing that somehow it was going to be possible for them to keep to the principles of the Good Friday Agreement, and not end up with some kind of border being reinstated either between Northern Ireland and the Republic or in the Irish Sea,” Mr Woodward said. 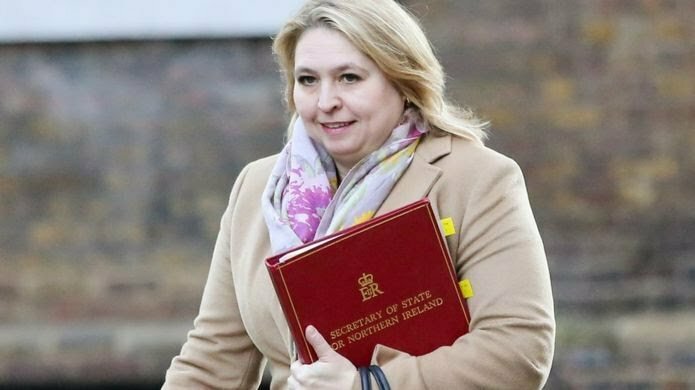 DESPITE Karen Bradley’s claims that killings at the hands of the security forces were “not crimes”, prosecutions have been brought in a small number of fatal shootings involving British soldiers. Legal proceedings are also active in several high-profile cases. 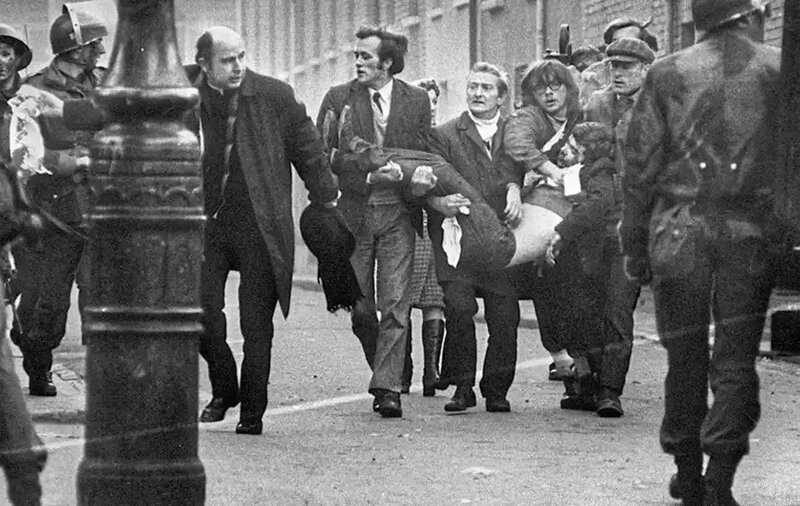 A file is currently under consideration with the Public Prosecution Service about whether soldiers involved in Bloody Sunday, in which 14 demonstrators were shot and killed in 1972, will be charged with murder and other offences. A decision is expected next week. 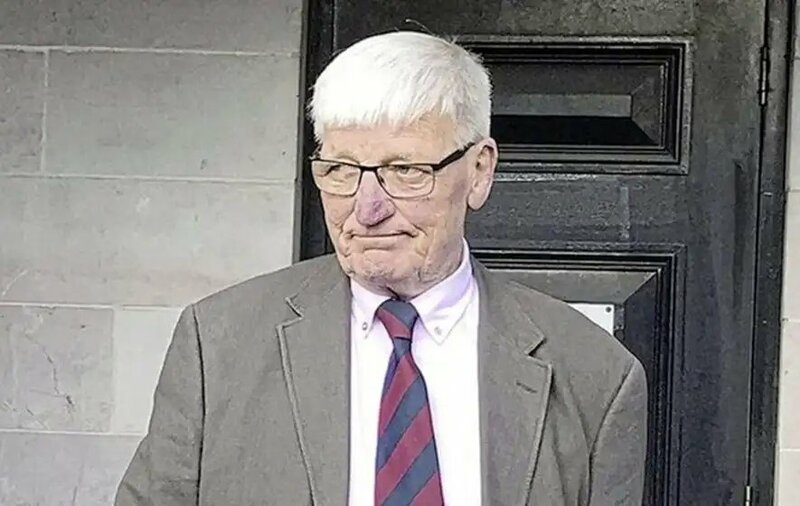 Another case ongoing is that of former British soldier Dennis Hutchings (77), who has been charged with attempted murder linked to the fatal shooting of John-Pat Cunningham, (27) in Co Tyrone in 1974. He was killed as he ran away from a military patrol in Benburb. It was later revealed he was an innocent bystander and had the mental age of a child. Meanwhile lawyers acting for a former British soldier accused of the manslaughter of Aidan McAnespie say they plan to travel to England to speak with him. Ex-Grenadier Guardsman David Jonathan Holden (49) has been charged with gross negligence manslaughter. He did not appear for a hearing in Dungannon last month. 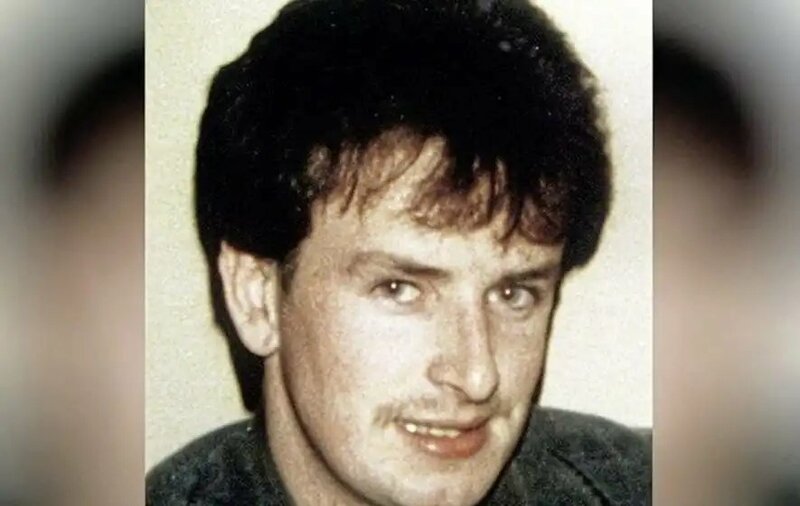 Mr McAnespie was shot dead close to a checkpoint on the border at Aughnacloy in Co Tyrone in 1988 as he made his way to Aghaloo GAC’s grounds. Two former paratroopers have also been accused of shooting an Official IRA man in the Markets area of Belfast in 1972. The pair, known only as Soldier A and Soldier C, were last year granted leave to seek a judicial review of a decision to have their case heard by a judge sitting alone. The defendants, now aged in their sixties, have been given anonymity. Prosecutions could also be brought against members of MI5 and an undercover military unit after an investigation into allegations of murder by the British Army double agent Stakeknife. Jon Boutcher, chief constable of Bedfordshire Police, is understood to have questioned former army personnel as part of Operation Kenova which is investigating allegations of serious criminal activity during The Troubles. Throughout the Troubles a number of British soldiers have been convicted of shootings while on duty. In 1972, Michael Naan (31) and Andrew Murray (23) were killed in what became known as ‘The Pitchfork Murders’. They were stabbed to death by members of a British army foot patrol near Newtownbutler. It was six years later before it emerged that members of the 1st Battalion Argyll and Sutherland Highlanders were responsible for the killings which were described by a pathologist at the time as “frenzied”. Several members of the patrol were subsequently convicted for their parts in the killings. 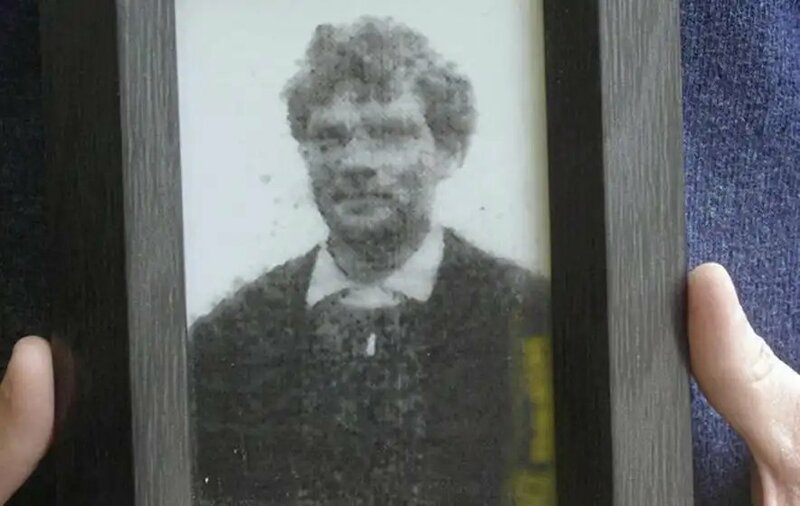 Thomas ‘Kidso’ Reilly (22) was killed by Private Ian Thain, on Springfield Road on August 9 1983. He served just over two years in a military prison before being accepted back into the army. Scots guardsmen, Mark Wright and James Fisher, were convicted of killing 18-year-old Peter McBride in 1992. Following a high-profile campaign they were eventually released in September 1998, and went back into their regiment. Lee Clegg served four years in prison for the murder of teenager Karen Reilly (18) in 1990. He was cleared at a retrial in 1998 and returned to the Parachute regiment and was later deployed to Afghanistan. North of Ireland’s 🙈🙊🙉 secretary of state Karen Bradley: has already won herself a reputation as the stupidest and most inept secretary of State anyone can remember. The British prime minister, Theresa May, puts on a special voice when she’s reassuring the DUP about “our precious, precious union”. We all know she only does it to hold on to their precious, precious votes. However, it is now clear she is dangerously willing to pay any price for the highly equivocal loyalty of that party. She has already alienated the majority of Northern voters, those who voted to remain in the EU, over Brexit. Now she has shown that her government will trample on the independence of the legal system, jeopardise trials and inquests, and grievously insult the families of children, women and men bereaved at the hands of her security forces. It was the DUP’s Emma Little-Pengelly who asked the question in parliament on Wednesday. With so much focus on the 10 per cent of people killed by the security forces during the Troubles, she demanded, what was the government going to do for the other 90 per cent, those she called the “innocent victims of terrorism”. As it happens, Little-Pengelly’s father was convicted, in France, of involvement in a loyalist gun-running plot. Alongside the late Ian Paisley, Peter Robinson and Sammy Wilson, he donned the red beret of the Ulster Resistance Movement. He denies he actually imported arms. The DUP distanced itself from the group after it came out that it had imported weapons. But when it gets exercised about terrorists, the DUP is referring, by and large, to the IRA. It is left to others to point out that mounting evidence of collusion between the security forces and loyalist paramilitaries skews all the figures. The context of Little-Pengelly’s question is the impending announcement by the Public Prosecution Service about whether or not paratroopers will face prosecution over the role of the regiment on Bloody Sunday in Derry in 1972 when 13 unarmed civilians were murdered. Secretary of State for Northern Ireland Karen Bradley thanked her for asking. Killings during the conflict by soldiers and police were “not crimes”, she said. These people were “acting under orders and under instruction and fulfilling their duties in a dignified and appropriate way”. 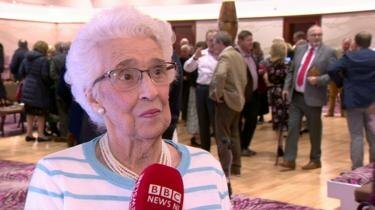 Harrowing evidence While she was speaking, an inquest in Belfast was hearing from a man who said he had spent the last 48 years trying to forget what he had seen on the day he was shot as a nine-year-old child by a British soldier during what has become known as the Ballymurphy Massacre. The Butler brothers were shot at as they tried to run away across a field. They saw soldiers flinging injured people and bodies into the back of a Saracen. One teenager was crying. “One of the soldiers pulled out a gun and said F**k up, you c**t and shot him once or twice towards the chest. There was no sound from him after that,” Edward Butler said in evidence. Relatives of Joan Connolly who had come out of her house to search for her daughters, sobbed as they heard harrowing evidence of her final moments after she was shot in the face. Those soldiers were from the Parachute Regiment. Had the regiment been disciplined in any way for its actions that day, its soldiers might not have felt free to go on a similar rampage in Derry six months later – on what will henceforth be known not as Bloody but as Dignified and Appropriate Sunday. Bradley has already won herself a reputation as the stupidest and most inept secretary of state anyone can remember – she laughingly boasted that when she was given the role she had not known that nationalists did not vote for unionists, and vice versa. Now she has blundered into undoing the tentative healing which began with former prime minister David Cameron stating in 2010 that the killings were “unjustified and unjustifiable”. She has also inadvertently lent her support to those who argue that it is various decorated gents including Gen Sir Mike Jackson who should be in the dock since they were the givers of orders and instructions. Outrageous comments More shocking even than her outrageous comments was the fact that while the SOS (oh the aptness of that acronym!) was speaking, her Tory colleagues on the benches behind her continued to chat among themselves, as oblivious to what Bradley was saying as they were to the television cameras. At one level, it is just another demonstration of how little the parties at Westminster care about the North. For years now, MPs have been racing each other to the exit doors whenever it comes up. Bradley rushed through Northern Ireland’s budget last week to benches that were almost empty. Report after report shows that the North is likely to be disproportionately badly impacted by Brexit, particularly if there is no deal. That hasn’t stopped the Conservatives, particularly the extreme Brexiteers who are favourites among the DUP, from flirting with that outcome. But it is worse than that. When the British government signed up to the Belfast Agreement in 1998, it committed itself to “rigorous impartiality”. In her desperate bid to hold on to power at any cost, the prime minister has abandoned all pretence of this. As for the profundity of Bradley’s belated apology – we already have irrefutable evidence that this secretary of state is deeply, deeply shallow. Is it reassuring when a senior politician says, “I want to be very clear – I do not believe what I said. That is not my view” ? It is not. 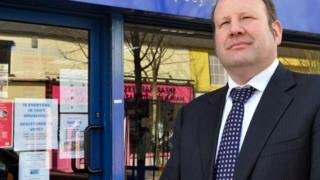 The DUP says a leaflet produced by a councillor for the upcoming elections that cites “local homes for local people” was not sanctioned by the party. Graham Craig is a DUP councillor in the Botanic area. BBC News NI has tried to contact Mr Craig for comment but has yet to receive a response. The leaflet also says Mr Craig will focus on “taking back control of immigration”. But DUP councillor Lee Reynolds said housing and immigration were matters that should be handled sensitively. In a statement on Twitter, Mr Reynolds also said the matter had been referred to party officers. Lee Reynolds is the DUP’s Belfast city council group leader. “An instruction that it should not be distributed has been given to councillor Craig,” added Mr Reynolds. The leaflet has been criticised by the Alliance Party leader Naomi Long. She said there was no place for “this kind of dog whistle racism and sectarianism in our community and all parties need to stand together on that”. Mrs Long said she welcomed the DUP’s response and looked forward to action being taken regarding Mr Craig’s actions. A letter from the head of NI’s civil service warning about the impact of a no-deal Brexit has been dismissed by a DUP MP as “scare tactics”. 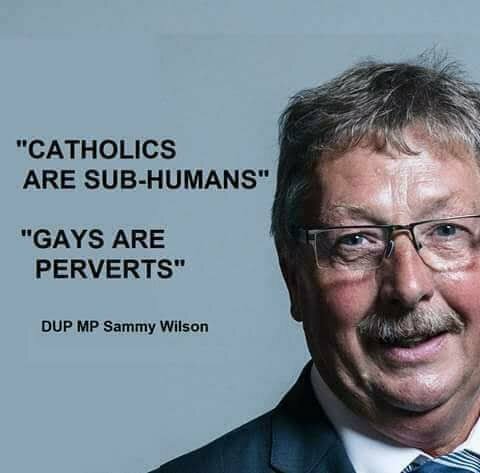 Sammy Wilson was giving evidence to Westminster’s NI Affairs committee. On Tuesday, a letter from David Sterling to NI’s political parties warning about “grave” consequences was published. Mr Wilson said he did not care if Mr Sterling “was head of the civil service or Santa Claus”, that he was wrong. But the House of Commons rejected the government’s first Brexit deal over the Irish border backstop, and talks are continuing in Brussels between the UK and EU in a bid to negotiate changes to the withdrawal agreement. 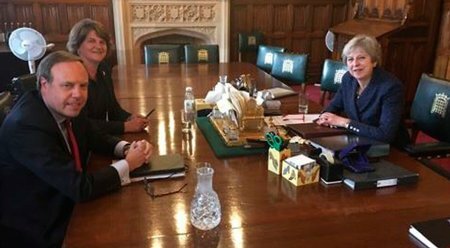 The DUP has said it will not support the deal unless there are “legally binding” changes to it. Mr Wilson was asked by DUP colleague Ian Paisley about his views on those who said a no-deal Brexit would lead to a united Ireland. Mr Wilson dismissed that as “scare tactics”, and said another example of that was the letter from Mr Sterling. “The fact of the matter is he has got it wrong,” Mr Wilson told MPs. The NI Affairs committee is also hearing evidence from Green Party leader Clare Bailey, Traditional Unionist Voice (TUV) leader Jim Allister and People Before Profit (PBP) MLA Gerry Carroll. They are being asked about the Brexit deal, the Irish border backstop and how Northern Ireland should be represented in future UK-EU negotiations. People Before Profit’s Gerry Carroll said “civil disobedience on the streets” could be the result of a no-deal Brexit. The MLA said his party would call on people to protest against “any resurrection of a hard border”. He cited evidence from the PSNI chief constable that any future checkpoints could be a target for dissident violence. “It is very dangerous, it’s tantamount to playing with fire if people think they can erect more checkpoints or security on the border,” he said. Mr Carroll said he believed there would be protests across the island, not just at border areas, if a no-deal Brexit led to any hardening of the Irish border. AS THE British parliament ties itself in knots trying to solve the self-inflicted wound of Brexit, it is the success of the 1998 agreement between the two Irelands that is the biggest stumbling block to Britain’s leaving the European Union. Two decades ago, Irish Americans came together to pressure the White House to overpower objections in London and the US State Department and grant Sinn Féin’s Gerry Adams a visa. That broke a political gridlock that led to the appointment of George Mitchell as Special Envoy and the Good Friday Agreement. Let there be no doubt. Irish America stands with the Irish North and South who are adamant that a hard border must not be restored. If it is, Irish Americans are prepared to saddle up again to oppose any post-Brexit UK-US trade deal. These are not idle words. Irish-Americans Congressman Richard Neal, Democrat of Massachusetts, is the chairman of the House Ways and Means Committee where proposed trade deals are first considered. Other members of Congress who have significant say in any trade negotiation are either Irish American or have significant Irish American constituencies. They have made no secret of their insistence that a soft border, one where goods and people can continue to flow freely across it, is an imperative. The facts of the matter are that, when it comes to the so-called backstop, there are no good options for the UK. Either there will be a hard border between the Republic and the North of Ireland, with all of the concomitant economic and human costs and which threatens to reignite the Troubles. Or there will be no border, which will mean that the North of Ireland will effectively remain in the European Union, and the rest of the UK will not. Irish American leaders have already been in the halls of Congress making their position crystal clear. We cannot support the return of a hard border between the Republic and the North, just like we can never accept the return of the sectarian discrimination and bigotry that fueled the Troubles in the first place. And it is not lost on anyone on this side of the Atlantic that while England and Wales voted for Brexit, the North of Ireland voted to remain in the European Union, as did Scotland, where the vote has reinvigorated the movement for Scottish independence. The overwhelming majority of the Irish North and South have expressed a clear desire to remain in the European Union. London ignores that reality at its peril. BRIAN O’Dwyer is a native New Yorker, whose family originates in Co Mayo. He has been involved in the promotion of Irish and Irish-Amercian interests for decades. He was a founding member of the Irish American Democrats and part of the delegation that accompanied President Clinton to Ireland on each of his three trips. He also served as an advisor to the White House on Irish issues, including the peace process. 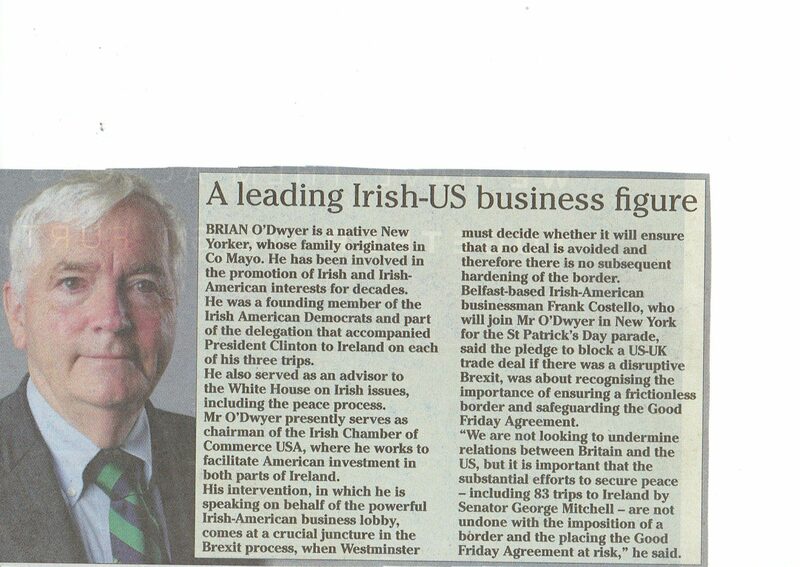 Mr O’Dwyer presently serves as chairman of the Irish Chamber of Commerce USA, where he works to facilitate American investment in both parts of Ireland. 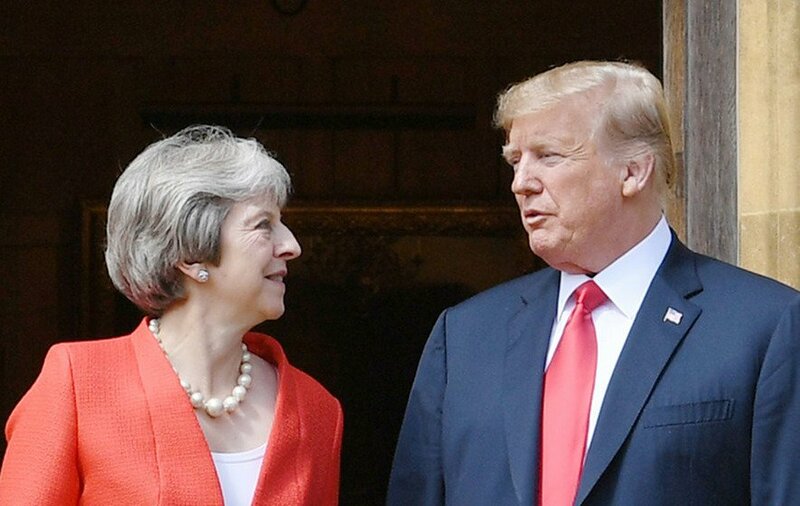 His intervention, in which he is speaking on behalf of the powerful Irish-American business lobby, comes at a crucial juncture in the Brexit process, when Westminster must decide whether it will ensure that a no deal is avoided and therefore there is no subsequent hardening of the border. Belfast-based Irish-American businessesman Frank Costello, who will join Mr O’Dwyer in New York for the St Patrick’s Day parade, said the pledge to block a US-UK trade deal if there was a disruptive Brexit, was about recognising the importance of ensuring a frictionless border and safeguarding the Good Friday Agreement. “We are not looking to undermine relations between Britain and the US, but it is important that the substantial efforts to secure peace – including 83 trips to Ireland by Senator George Mitchell – are not undone with the imposition of a border and placing the Good Friday Agreement at risk,” he said. With many thanks to: The Irish News and OPINION: Brian O’Dwyer ◾Brian O’Connor is an attorney and served as adviser to the Clinton White House during the peace process.